Mistah FAB releases a bonkers remix of his Mac Dre tribute "Still Feelin' It." Mistah FAB's Son of a Pimp 2 standout "Still Feelin' It," a souped up rework of Mac Dre's "Feelin Myself," is one of the finest blappers of 2016. 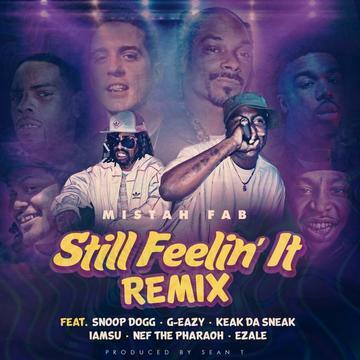 But FAB wasn't done there -- this morning, he released a bonkers "Still Feelin It" remix featuring a California murderer's row of Snoop Dogg, G-Eazy, Iamsu, Keak da Sneak, Nef The Pharaoh and Ezale. In addition to "Feelin Myself," the song interpolates the beats from Mac Dre's "Get S.T.U.P.I.D. ", Keak da Sneak's "Hyphy," and T-Pain's "Up Down." There's so much going on, it's a bit of a mess -- a glorious mess. Can I get a YEEEEE?